Seneca - By: Charles Curtain Co.
Dimensions - 102"W x 36"L. Fits a single window. Use insert valances to expand for fitting wider windows. Dimensions - 102"W x 63"L. Use Insert Valances to expand to fit wider windows. Item is discontinued. Sienna is only color in stock. 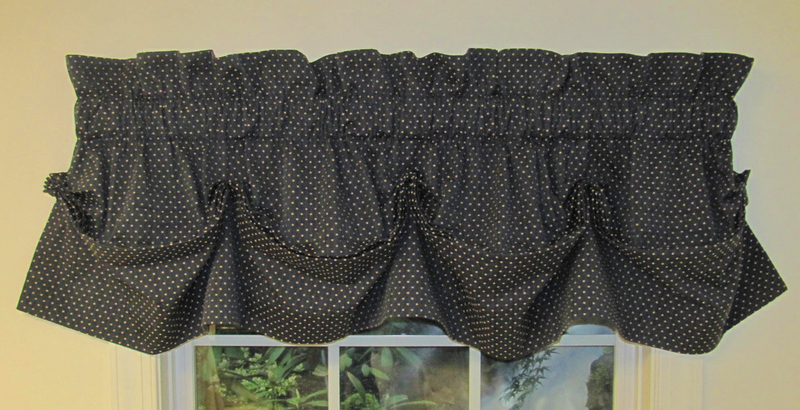 Dimensions - 54"W x 17"L. Use the Insert Valance to expand a 3 pc. Jabot Set to fit a wider window, or stands alone beautifully on it own. Item is discontinued. Very limited quantity and colors. Photograph features 2 insert valances in Ecru. Dimensions - 100" x 84"
Dimensions - 80"W x 17"L. Fits a single window. Item is discontinued. Very limited quantity and colors. Color featured in photograph is Ecru. It looks difficult, but with sewn in place gathers, there is nothing for you do but hang in on a rod! Beautiful folds develop naturally, giving that tucked appearance. Unlined. Fabric Content: 100% Cotton, dry cleaning is recommended. Seneca is a woven cotton jacuard with a handsomely textured diamond pattern. Seneca is a very attractive fabric design and functional as well; it is simple to coordinate these with other decor and can be used in any room. Topper treatments include a 3 piece Jabot Set in 36 and 63 inch lengths, an Insert Valance used to expand a Jabot Set for accomodating larger windows or as a stand alone, a Tucked Valance, and an Blouson. Matching Panels are also offered. Seneca has been discontinued. Limited quantities and colors are available. Fabric content is 100% Cotton. Dry cleaning recommended. CALL OR EMAIL FOR FEE FABRIC SWATCHES.